Tomorrow is October 1st, which if you have been around here for a while you know that means I join Nester in writing each day for 31 days during the month of October. This will actually be my 4th year writing a 31 days series during the month of October. In 2011 I wrote 31 Days to Decorate your Home on a Budget. In 2012 I wrote and DID 31 days of Pinterest: Pinned to Done. I chose 31 pins off my Pinterest boards ranging from DIY projects, crafts, and recipes, and actually did them! And in 2013 I wrote 31 days of Fall Inspiration. 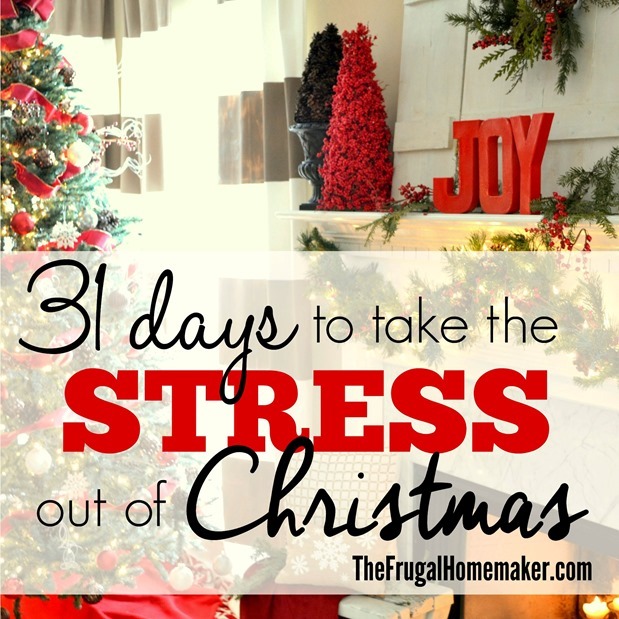 This year I will be writing and learning right along with you in a series entitled 31 Days to take the Stress out of Christmas. 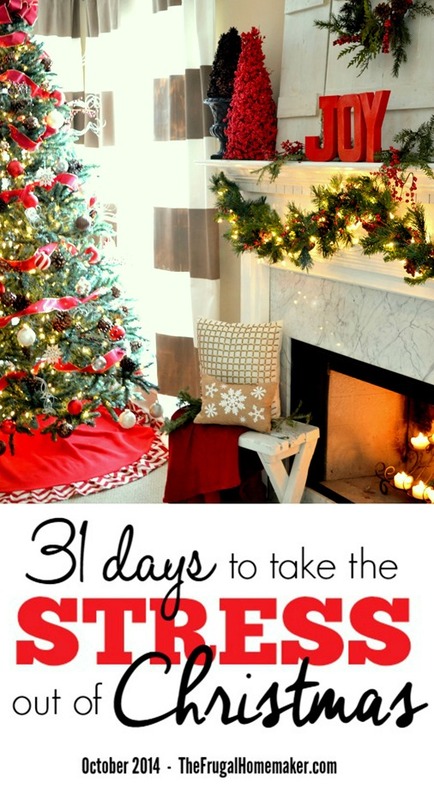 Since Christmas is coming faster than we think, I thought this would be the perfect opportunity to step back before the stress begins and examine why that time can be so stressful and what we can do to change it. I plan to share ways you can start NOW to do prep work so that there is not so much on your to-do list once the final bite of turkey is consumed at Thanksgiving. Ideas for home-made gifts, shopping for gifts, wrapping gifts, Christmas cards, decorating, along with scheduling, planning, making things more simple – all of those and more will be discussed. I want this series to be something that I can and will and I hope you will want to use each year in the months leading up to Christmas to prepare ahead, plan, and think about how you will keep the stress out of Christmas and truly enjoy the season for what it is. I think we all would love just relish in the season, relax and make lasting family memories, and truly enjoy reflecting on the true reason for the season. But often all the extra “to-do’s” that get added to our list that month seem to make that impossible. So come join me starting tomorrow and every day during the month of October as we plan, dream, and get inspired for Christmas. Make sure to subscribe by email to get every post delivered directly to your inbox, or follow along on facebook. This post will serve as the directory for this series and I will add each day’s link to this post after they are posted. So you can bookmark or pin this post and at any time come back to it to see every link to this series. I can’t wait!! I’ve loved your other “31 days” series, and know this one will be just as good! Can’t wait to read about your tips, decoration ideas, inspiration, etc.! Oh! I can’t wait! You always come up with best ideas! I, too, loved each year’s series and re-read them periodically. This year’s series is a great topic. Thanks for your work and dedication. What a great idea and I look forward to the series. Finally being in new home I want to really enjoy the holidays. After a year of waiting I’m looking forward to new decorating for the new house. Right after Thanksgiving things will roll. I hope you gained some great ideas! I can’t wait to follow along with this series! With a baby due the week of Thanksgiving, this is going to be the most stressful holiday season for us to date. If I could hurry up and get this nursery done then maybe I could get some holiday stuff done ahead of time too! It looks like another good series this year! I love Christmas but it can get stressful at times, so I look forward to reading what you have to share! Hope you enjoyed it, Kristen! Thank you for being a faithful follower! Oh my goodness, I am obsessed with Christmas so this series is absolutely perfect for me! wonderful – hope you enjoyed it! Love this! I so inspire to have a drama-free holiday season. Hopefully the rest of the family will get on board. 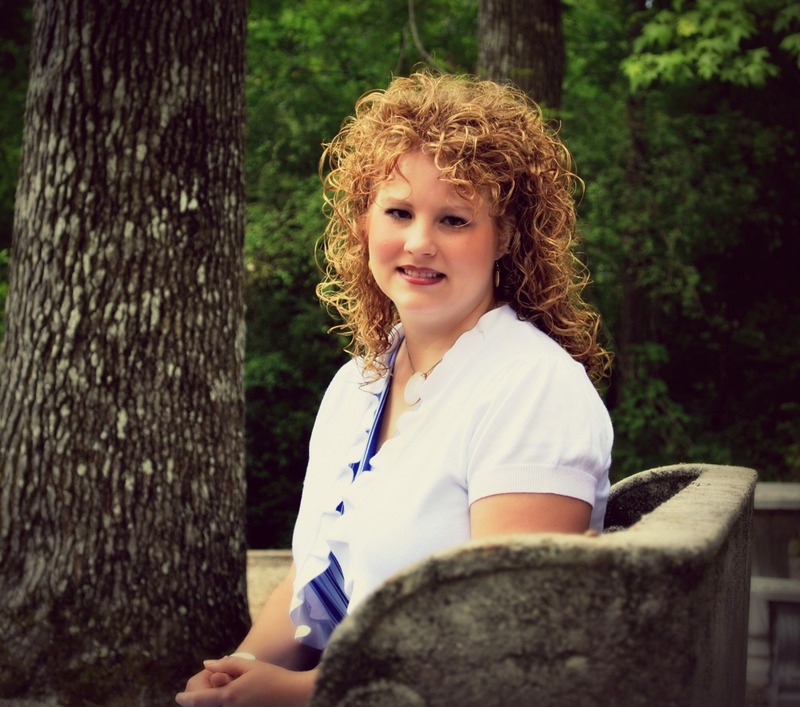 Janet Fazio recently posted..Madison’s Women’s Expo 11/22 & 11/23: Let the Shopping Begin!